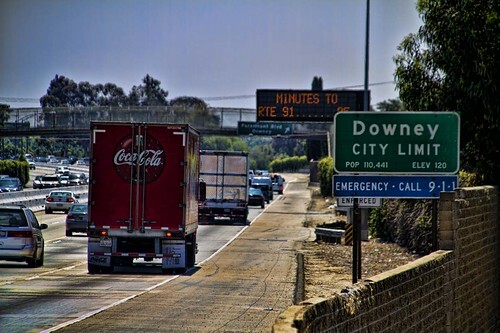 One of the things I consider a benefit of living in Downey is the proximity to so many freeways. One of those freeways is Interstate 5. Here is a view of the interstate from the edge of the Rio Hondo riverbed. It is an old freeway, and is quite unpredictable regarding traffic, but it is the route I use on a regular basis. According to Wikipedia, Interstate 5 (I-5) is the main interstate highway on the west coast of the United States, running largely parallel to the Pacific Ocean coastline from Canada to Mexico. It serves some of the largest cities on the U.S. west coast, including Seattle, Portland, Sacramento, Los Angeles, and San Diego. It is the only interstate highway to touch the U.S. borders with both Canada and Mexico. By the way, we have President Dwight D. Eisenhower to thank for our interstate system. In 1956, he signed the federal highway act and worked with Congress to find funding.